This is pretty much a non-recipe, but a few details made this preparation so delicious, I must share. First of all, you’ll need to use the best juicy large tomatoes you can find. We got heirloom tomatoes that turned out perfect. Slice them thick, no skinny slices. Same goes for the eggplant slices, and once you grill them, 2 minutes per side and you are done. This will preserve some of the eggplant texture, it won’t go all mushy on you. I often make the mistake of over-grilling eggplant. It gets bitter and limp. No bueno city. Make the dressing by mixing the olive oil, lemon juice, herbs, salt and pepper. Whisk well to emulsify. Cut the eggplant in thick slices and brush each side with some of the dressing. Reserve. Slice the tomatoes, place over a platter and brush each slice very slightly with the dressing. Reserve. Grill the eggplant two minutes per side on a very hot grill. 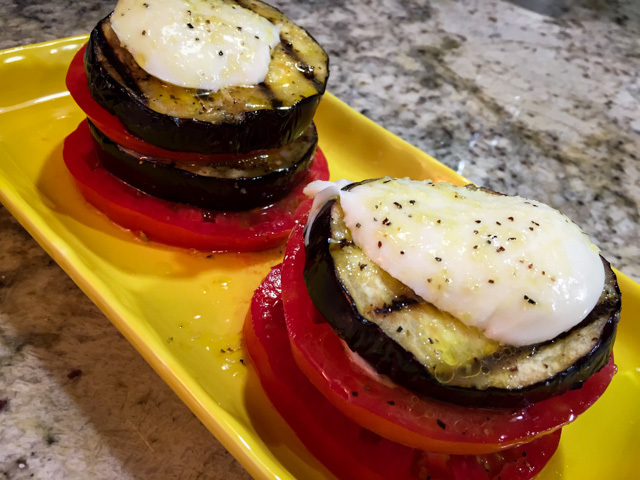 While hot from the grill, assemble the stacks, starting with a thick tomato slice, then a slice of hot eggplant on top. Add a slice of mozzarella, continue stacking the veggies. Top with a thin mozzarella slice, and drizzle any dressing leftover on top. Add a tad more salt and serve. Thanks for sharing the love…. I am looking forward to making it again… in fact I have an eggplant waiting, and some tomatoes almost at the perfect stage or ripeness….. hummmmmm…..
That’s the thing about Italian cuisine, few simple ingredients that make for some very loud dishes. I love everything about this recipe Sally! It’s so true! No need to fancy it up with sauces or anything – super simple and so very tasty! Now I’m regretting using up all our CSA tomatoes yesterday! Definitely hitting up the farmer’s market this weekend..I need this! I like the thought of cold, fresh mozz on top of a grilled stack. Glad you posted. Non-recipe or not, this is a great idea and one I wouldn’t have thought of. We’re actually doing eggplant parm tonight. Maybe I’ll grab an extra eggplant for later in the week now too. 🙂 And let’s just keep those thoughts of summer ending at bay. 😉 I can’t take it (as I sit her in a long sleeve shirt). We’ve been promised warmer temps next week. Let’s hope. Have to enjoy it while we can. Soak it all up!!! !